About Movin'On Estate Sales and Liquidation Co. Welcome to the oldest and most experienced estate sale and liquidation company in Solano County! With 38+ years in combined hands-on experience, you don’t have to look any further for a local estate liquidation specialist. Whether you're downsizing from a larger home to a smaller one, or need assistance with selling the estate of a loved one, it is important to have someone you can trust to come into your home and manage the sale of household items you have lived with and have come to love. You need an expert to value the items you are selling and a caring person who is sensitive to the wide range of emotions at this time of transaction. Movin'On Estate Sale Company will take exceptional care of handling the liquidation, from the initial sorting of the items, through the final sale and clean-up. Real Estate agents assisting in their clients interest for a problem free transaction. People serving as Executors who must liquidate entire estates. People such as retirees who are moving from large homes to smaller residences. People making long-distance moves who don't want to incur the cost of moving large collections of household furnishings. Light clean/dust items to be sold. Advertise in newspapers and internet. Signs will be placed in area directing customers to sale as city codes permit. Mail special invitations to surrounding neighbors. Obtain the highest price for you, while still liquidating the estate. Set-up sale to be secure and safe for the customer. Clean-up after sale, "broom clean". Securing any overlooked personal items we may find that you want to keep. Provide full settlement from estate within one week of the end of sale. Staffing will always be professional, experienced and knowledgeable at all times at the home and in our sales presentation. We are a true estate liquidation company. Our goal is to sell everything, always obtaining the highest amount for you in a short amount of time so you can move-on. Estate liquidations and appraisals are all we do. We have no consignment store, therefore no "conflict of interest". We know that settling and liquidating an estate is a daunting task. By letting us work for you, it allows you to focus only on the things you want to keep as heirlooms. You can relax and let us take care of the liquidation of the estate. We want to be of service to you. If we can provide any other information, please feel free to contact us, for a free consultation. MOVIN'ON ESTATE SALES IS THE LEADING ESTATE CO. IN SOLANO COUNTY! Benicia Treasure Hunt, A 2 Day Estate Liquidation! One Sweet Suisun City Sale! A Classy Fairfield Estate! Our last 2018 sale. A European Vacation, An Upscale Vallejo Estate. A Designer Vacaville Estate Liquidation! This Fairfield Liquidation is MASSIVE! And we're not kidding! A Massive 2 Day Vacaville Estate Liquidation! A Very Mid-Century Vacaville Liquidation Sale. A Benicia Beauty! Our 3 day event. A BLAST FROM THE PAST! a Vacaville Collectors sale. Another 2 Day Fairfield Estate Liquidation. All is for sale including the Home! 2 Day Fairfield Sale with 1 day pricing! Another One Day "POP-UP" Susiun City Estate Liquidation! A ONE DAY VACAVILLE ESTATE LIQUIDATION! A 3 Day Vacaville Estate of Original Owner Home. A Fairfield Treasure Hunt. Our 3 Day Event! Final and Best day in Fairfield! A Leisure Town Estate, Our Vacaville liquidation. A Clean Original Owner Fairfield Estate. The Largest Estate Liquidation in Vacaville's recent history! A Leisure Town Home. An Estate Liquidation in Vacaville! A Designer Estate Sale in Vacaville! A Designer Estate Sale in Vacaville! Where Friday is the New Saturday! Her Grandmother's home, A Fairfield Estate Sale! His Grandmother's home, A Dixon Estate Sale! Unparalleled Elegance in Green Valley, A Liquidation Sale in Fairfield. A Suisun Estate Sale Adventure! A Fairfield Estate Sale Gem! A FAIRFIELD MYSTERY HOUSE LIQUIDATION! by Movin'On Estate Liquidation Co.
Vacaville Estate Sale! EVERYTHING GREATLY REDUCED AT SATURDAY'S OPEN! This company has posted a total of 147 estate sales. Only the most recent 50 sales are shown. 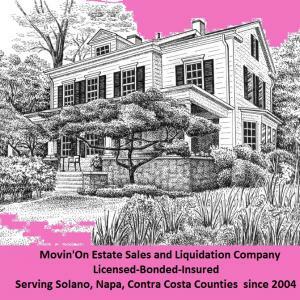 Follow Movin'On Estate Sales and Liquidation Co.